Following a shaky beginning in 1912, St. Anthony’s Church was officially opened in 1918, “free of debt and free of all encumbrances”. 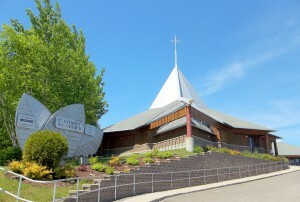 Originally an outpost mission serving migrants who came to work in the lumber and mining sectors, St. Anthony’s soon became a spiritual and cultural centre for its parishioners. This was accomplished under the energetic leadership of Msgr. Domenic Tomaselli. In his twenty five years at St. Anthony’s Msgr. Tomaselli oversaw the building of the first church and rectory. In 1969 with the retirement of Fr. Joachim Bortignon after seventeen years of service the administration of St. Anthony’s passed into the hands of the Scalabrini Fathers under the leadership of Fr. Umberto Rizzi C.S. The Missionaries of St. Charles (Scalabrini Fathers) were founded to serve migrant communities, and St. Anthony’s was deemed to be a national parish. In 1971 under Fr. Rizzi’s direction the church underwent a long needed renovation. Another pastor, Fr. John diVito C.S. introduced the celebration of St. Anthony’s Feast consisting of an outdoor mass and procession following the custom originated years ago in Italy. Following a tragic fire which destroyed the church on Banning Street, the parish was relocated to a site across the expressway. The new, fully accessible, church was completed in 1992 and continued under the leadership of the Scalabrini Fathers until 2013 when the Scalabrini Fathers turned the parish back to the diocese. Since August, 2013 the parish has been under the guidance of its new pastor, Fr. Luigi Filippini, a Diocesan Priest.